Carrying on with my latest trend of researching vermouths, I turn my attention to a well-known brand which graces nearly every drinking establishment in the world – Martini. Martini is an icon, and whether you savour it on its own, or utilise within the likes of a Manhattan or Martini, you can’t deny its international appeal. But how does a brand get to enjoy such global appeal? Well lets dive into the minds of the Martini masters, starting in 1863. The combination of three gentleman became the catalyst for Martini (or Martini, Sola e C.ia as it was then called). Alessandro Martini was a gifted salesman, Teofilo Sola the accountant and Luigi Rossi the wine, herbalist and liqueur expert. Luigi utilised his experience and encouraged the team to locate to Pessione, Italy. Here, the chances of riding on the trend of vermouth were maximised, with the hills being the source of some of the best grapes and herbs around, as well as close to the Turin-Genoa railway (four years later, it negotiated with Northern Italy Railways to build a private railway track inside the plant, connecting them directly to the royal station of Pessione). 1865 saw there efforts rewarded, winning a medal for ‘Excellent Quality of Liqueurs’ at the prestigious Dublin International Expo Awards. Wanting to expand on this, and seeing no reason as to stop with border line of Ireland, they adorned each label with the Dublin medal and diploma iconographies, sharing the success with all consumers and suppliers further afield. With this came many more entries to competitions, signalling their intent to make Martini, Sola e C.ia known to the world. The Martini, Sola e C.ia expanded to America in 1867, with the three-man team taking a risk by shipping crates of their vermouth to New York on a steamship named Hermann. A year later, the figures returned with confirmation that ‘Martini, Sola e C.ia exported three-quarters of the vermouth sold in the USA’. It was also within this year that they received a royal seal of approval. A new label came into play, featuring the brands latest Asti medal and accomplishments in Paris and Dublin. The label now featured the Royal House of Savoy (one of the oldest Royal Houses in Europe) and the title ‘By appointment to HRM, King of Italy’ on behalf of King Vittorio Emanuele II, instantly raising the prestige of Martini, Sola e C.ia. By 1873, each label were to be redesigned with ‘By appointment to their royal majesties, the Kings of Italy and Portugal’, again showing off its international following. In 1871, a letter was received from Shanghai requesting a ‘moscato spumante d’Asti’. Martini, Sola e C.ia were already producing a similar wine called Canelli spumante, but jumped at the challenge and began testing new flavours and techniques. Asti Spumante remains one of the best sellers in the Martini range to this day. Even when it came to transport, the team jumped at the challenge. Milanese agent, Girolamo Zucca, placed an order for three boxes of Fernet, a Martini digestive liqueur created in 1863. It was to be transported to Tehran, Iran. ‘Since the goods will travel on camelback for about two months, the boxes must be sturdy, each bottle will have to be packed in a small box with hay, and then packed with hay again in a large box…’ – Martini, Sola e C.ia duly obliged. 1879 became a sad yet turning year, with the passing of Teofilo Sola. In response, Alessandro Martini and Luigi Rosso, determined to uphold his memory, changed its trading name ‘Martini & Rosso’ in replace of ‘Martini, Sola e C.ia’. In 1882, Martini & Rossi were awarded with the gold medal at the ‘XII General Exhibition, Bordeaux – for wines, liquors and yeasted drinks’. The icon from Bordeaux remains on the label to this day, alongside those of Vienna in 1873, and Philadelphia in 1876. 1883 saw expansion, with Andrea Barberis, the company’s business developer in Argentina, proposing the build of a production site in the country to bypass the mounting customs duties. The Buenos Aires headquarters became the first outside of the Italian borders. Links with Cuba began in 1875 through Martini & Rossi’s connection with exclusive agents, Avignone and Brocchi. In a letter dated 1890, Juan Brocchi suggested the company needed to produce a new ‘dry’ vermouth if it wanted to keep up with the French Noilly Prat, who at the time were racing ahead within the world markets. Martini & Rossi took Brocchi’s advice and immediately began developing a new product of its own, resulting in the creation of Martini Dry in 1899, despite Luigi Rossi’s passing in 1892. Of course, not everything that a company makes can turn to gold. In 1863, Martini, Sola e C.ia ledgers registered more than 300 products produced and sold by the company. By 1894, ledgers show a reduced product range of 90, but many of them were market leaders, such as Anisette, Champagne de Reims, Cognac fin Champagne, Curacao, English Punch, Rhum Giamaica, Elixir Spay and Chinato Wine. In a way, you’d never get very far without exploring new recipes and testing the market! In 1903, Luigi Rossi’s brothers, Teofilo and Cesare, welcomed their younger brothers, Enrico and Ernesto, into the Martini & Rosso fold, spreading the family name to branches around the world. Two years later, Alessandro Martini passed away. In 1907, Cardinal of Turin, Agostino Richelmy, confirmed that Martini & Rossi’s wine, Montechiaro d’Asti Passito, ‘can be used to say Holy Mass, since it conforms to canon prescriptions…’. In Italy, religion is at the heart of society, and approval from the Cardinal was an honour. 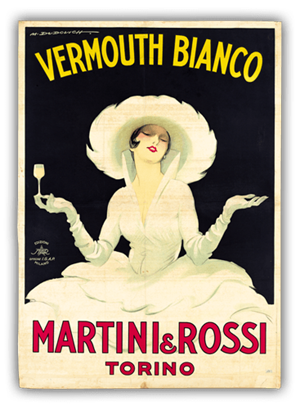 Martini Bianco was launched in 1910, and eight years later commissioned leading Italian painter, illustrator, and poster designer Marcello Dudovich to design his now best-known work, ‘La Dama Bianca’. 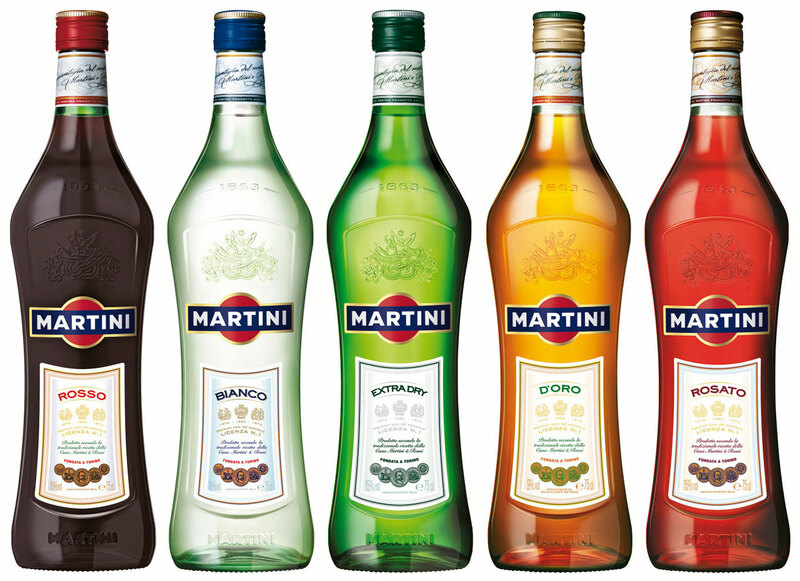 In 1925, Martini & Rossi designed its strongest label to date – ‘Martini’ in striking red capital letters. The team also tested out ‘Rossi’ as a solo name, but the bottles didn’t sell. Consumers had long referred to Martini & Rossi as ‘Martini’ and the team accepted the reality of the situation and the Rossi bottle was withdrawn. 1835 saw cousins Metello, Theo, Lando, and Napoleone become the third generation of Martini management and they threw themselves into sport, art, industry and society. Metello and Theo supported international sporting competitions, Lando’s art collection filled the Museum of Oenological History and Napoleone embraced new production techniques and welfare reform. In 1987, Martini had enlisted Bacardi to distribute within America, and six years later joined forces to create a production, commercial and distribution network, now seen as one of the world’s largest premium spirits company. Aromas of herbs, floral and spices blending well on the nose. A dry palate, with flavours of fresh fruit dancing to a short finish. A strong scent of bitterness on the nose, a mix of oranges and caramel. Sweeter on the palate, with a soft texture producing a dry, herbal finish. Combine all ingredients over an ice filled rocks glass and garnish with an orange slice. The Martini name has stood the test of time, and have been innovators in marketing, distribution and of course the products that they have created. It may be everywhere you look, but there’s a reason behind it – it’s not a bad product at all. Enjoy.